Mahatma Gandhi University/MG University centralised allotment process 2013, single window online registration for admission in various degree (UG/PG) courses have been started @ http://www.cap.mgu.ac.in/. As initiated in 2011, the centralised allotment process (CAP) would serve to fill seats to the UG courses in government colleges, 70% in aided colleges and 50% in self-financing colleges. Mahatma Gandhi University also known as MG University has started the centralised allotment process 2013/ single window online registration for admission in various degree (UG/PG) courses. As initiated in 2011, the centralised allotment process (CAP) would serve to fill seats to the UG courses in government colleges, 70% in aided colleges and 50% in self-financing colleges. 30% of seats have been reserved for management and community quotas in aided colleges. Through this open process students can apply for degree programmes like B.Sc., B.A., B.Com, B.B.A., B.C.A. and other new generation courses which are being offered through government, aided and self-financing colleges affiliated to MG University. MG University centralised allotment process or CAP is an internet based single window system which is being set to give allotments to the various academic programmes offered by the University Departments and affiliated colleges. The selection is made on the basis of the options submitted by the candidates. 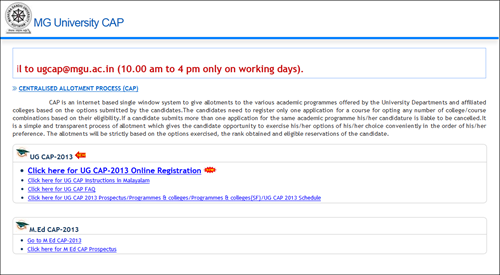 As per the process, the candidates need to register only one application for a course. This application can be used for opting any number of college/course combinations based on their eligibility. If a candidate submits more than one application for the same academic programme, his/her candidature will be cancelled. Through this method the candidate will get an opportunity to exercise his/her options of own choice easily according to his/her preference. The allotments will be strictly based on the options exercised, the rank obtained and eligible reservations of the candidate. Students who wish to register and apply should submit the relevant details online through the University web portal www.mgu.ac.in. In addition to the Study Centres and the Information Centres of the University, the registration procedures can be completed through the facilities provided by IT@School Project and the Akshaya Centres of the government. The University has entered into a Memorandum of Understanding (MoU) with the State Bank of Travancore (SBT) to facilitate a hassle-free payment option for students. The application fee has been fixed at Rs. 150 for applicants in the general category and Rs. 80 for those belonging to the Scheduled Castes and the Scheduled Tribes categories.